To help children develop a lifelong love of books, it's important to get kids interested in reading as early as possible. Fostering a love of literature isn't something parents have to wait for. Just because a baby can't read doesn't mean he can't learn to love books. Some parents begin to read to their children before they're even born. Babies in the womb can hear and can recognize their parents' voices, so beginning to read aloud while a child is in utero isn't too early! Once a baby is born, buy baby-friendly reading material such as cloth books or board books that are sturdy and made to withstand rough handling and teething. You can also purchase plastic bath books, which are designed to go into the tub with children. Picture books provide visual stimulation as well as letter and word recognition. As kids grow older, you'll be able to surround them with all kinds of books, magazines and newspapers. Read yourself: This is one of the most important things a grown-up can do to get kids interested in reading. Children model those around them. If they see you reading books, magazines, articles and newspapers, they'll begin to do it, too. Provide plenty of reading material: Surround a child with books and chances are, she'll reach for them, especially if you limit other distractions like television and video games. 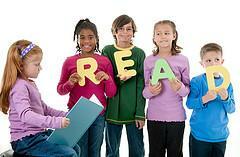 Read to them: Even children who are old enough to read independently enjoy having a parent read to them. This can be a wonderful bonding activity that doesn't have to end once a child can read on his own. Let them take the lead: Anyone prefers to read about themes or stories that interest them. Some people love pirate stories; others prefer books about outer space; still others like funny rhymes like those written by Dr. Seuss. It's always a good idea to let kids choose their reading material, as long as it's appropriate for their age and reading level. Visit libraries and bookstores: Make your local library a place to visit often. Not everyone can afford to buy books all of the time, which is why the library is such a great resource. Save the bookstore and buying books for a special treat. Give books as gifts: If you can't afford to buy books often, they can be treasured gifts when birthdays, holidays or other special occasions arise. When family and friends ask what they should give as presents, tell them to buy your child a book about his favorite subject matter. Create a reading spot: Give your child a comfortable, quiet zone in which to read. This can be a corner of the family room or a spot in her bedroom. Outfit it with inviting chairs, beanbags or pillows. Let him know that this is his special area where he can go whenever he wants to read in peace. Look for summer programs: If you're having a hard time keeping your child interested in reading when she's out of school for the summer, look into local bookstores or libraries, which often run programs that encourage reading. It can be as simple as a paper that records all the books a child reads (signed by a parent) - after reading a certain number of books, kids are rewarded with a free book or other prize. Anyone who loves to read knows that books provide entrance to other worlds that aren't limited by imagination. By beginning to read to children well before they can read themselves, you teach them that reading is important; this is a lifelong skill that they can enjoy forever.